A personally handmade gift means much more to both giver and recipient than one that has been bought from a shop, and with a few easy techniques it's possible to make a card, gift, or decoration that is not only unique, but professional and eye-catching. A personally handmade gift means much more to both giver and recipient than one that has been bought from a shop, and with a few easy techniques its possible to make a card, gift, or decoration that is not only unique, but professional and eye-catching. Elizabeth Moad is a busy papercrafter, workshop tutor, and author. Moad is accomplished in many crafting techniques, but is widely known for her talent in papercrafts and especially paper quilling. She is a regular contributor to UK magazines such as Papercrafter magazine and has run card-making workshops in Suffolk for the past six years. She lives in London, United Kingdom. 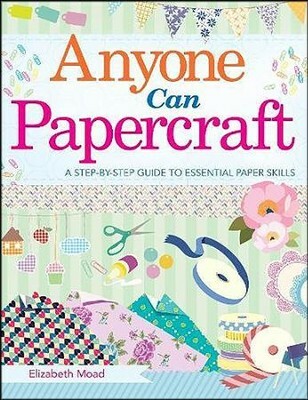 I'm the author/artist and I want to review Anyone Can Papercraft, A Beginner's Step-by-Step Guide to Papercrafting Skills.